The sirloin steak is easier to slice if it’s partially frozen. Using the steak allows for a very quick sear and a short simmer time that results a quick and easy week night dinner. A hearty dash of Worcestershire sauce really enhances meat-based dishes. It’s a liquid condiment that offers a rich, savory flavor to meat dishes and beverages (it’s made from garlic, soy sauce, onion, molasses, lime, anchovies, and vinegar). Sautéing the aromatics (garlic and onion) first helps define their taste by taking their pungent edge off and allowing them to develop a natural sweetness. White button mushrooms are delicious in the creamy sauce; for a different flavor, try shiitakes (remove the stems and slice them) instead. It’s important to create a slurry with the flour and broth so the mixture will blend in with meat mixture in the skillet without forming lumps. Bringing everything to a boil thickens the skillet dish and cooking it for a minute or two cooks away any raw flour taste. Once upon a time, there really was a guy named “Stroganoff” (in the Anglicized version), which is the reason for the name of the delicious beef and pasta dish we’re still enjoying today. Pavel Alexandrovich Stroganov, a 19th century Russian aristocrat, loved good food and hired a famous French chef to prepare his meals. Many food historians think it was Stroganov’s cook, André Dupont, who had the idea to name his special beef fricassee for his employer—and with that, beef stroganoff was born. Your family may want to rename this dish after you after just a few bites of the hearty, creamy goodness of this top-rated Betty Crocker recipe. 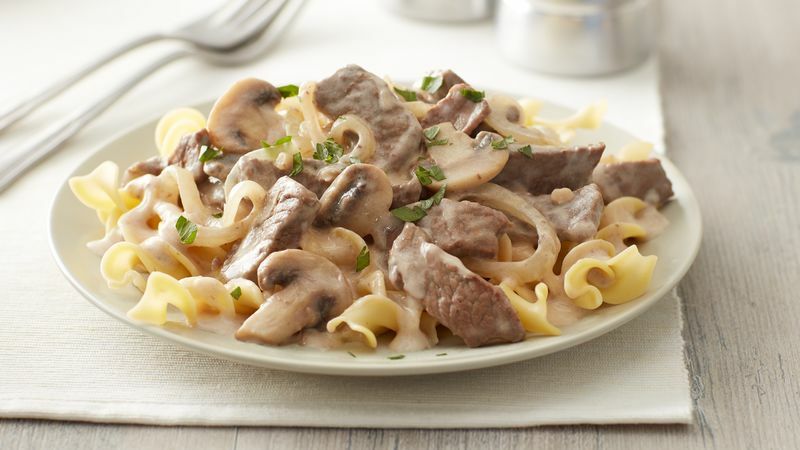 While this beef stroganoff recipe is the classic preparation usually associated with the dish, there are all kinds of fun new twists and streamlined time-savers to be found in Betty’s best beef stroganoff recipes, including Slow-Cooker Beef Stroganoff and One-Pot Beef Stroganoff.